97 vintage electric musical toys in one single instrument! 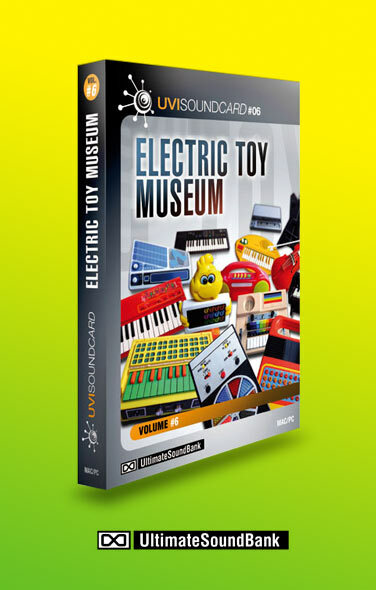 This is certainly the most insane sound library in the market: 97 vintage musical toys were carefully sampled in the very best conditions, 24 bits / 96khz quality, most of them recorded with the best microphones and preamps. With more than 1000 presets and 14 000 samples, you will feel like having all these toys right under your fingertips. Every aspect of each machine has been captured: multi-sampled instruments with release samples for every note, rhythms converted into sliced loops, GM drumkits created, FX and speech voices carefully organized in 10 categories: Children, Developed, Drums & FX, Mini Sampler, Musical Toys, Organ Basic, Silly, Small, Speech & Style-o-phone.